Spokane City Councilwoman Karen Stratton (right) takes a break from campaigning to snap a selfie with local activist Kitara Johnson. Diane Crow stands in the parking lot at Indian Trail Elementary School before six people who are giving up a few hours of one of the last days of summer to talk to strangers. 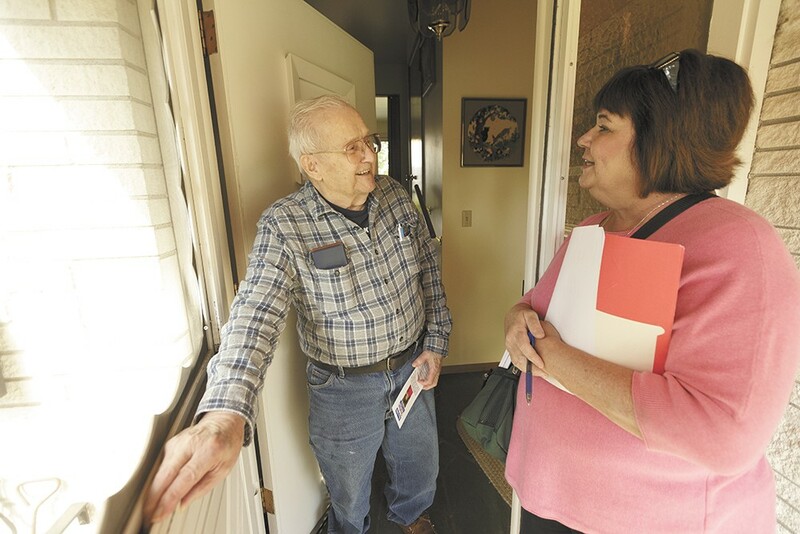 Specifically, they're here to ring doorbells alongside Karen Stratton in hopes of convincing voters that she should keep her seat on the Spokane City Council. Crow, an old friend of Stratton, explains what to do: Wear a name tag, have a script to read from, don't put campaign literature in the mailbox, she says. Also, adds Crow, be prepared to remind voters that the race is nonpartisan. "Do you know what nonpartisan is?" she asks. "What I usually say is these are nonpartisan races: They look at the citizens and the district; that's what the vote is basically on." The race is indeed technically nonpartisan. But it's drawn interested parties, namely the mayor, the city council president and their allies, who are keen on shaping its outcome. After working for a decade in city government, including for two mayors, Stratton, 56, successfully applied last year to fill out the term of Councilman Steve Salvatori, who resigned early and moved away. Since then, she's become associated with the council's so-called veto-proof majority that's helped left-leaning Council President Ben Stuckart thwart the more right-leaning Mayor David Condon. The mayor, hoping to tip the balance on the council, is backing Evan Verduin, the owner of architectural design firm Studio Called MAKE, who Condon says will bring a needed business-oriented perspective to the council. Verduin says Stratton votes in near lockstep with the council's majority, which he says has strayed from its core mission of municipal services into divisive social issues. Karen Stratton speaks with voter Millard Lamb while door-belling. "The way [Stratton] is going to vote on issues is pretty predictable," says Verduin, who says he'll be more independent. "And I think there needs to be someone who is more willing to say what is in the interest of Spokane, the community and our district." Stratton says the mayor's level of involvement in the race has damaged their relationship. The assertion that she and the council don't support business is ill-founded, she says. "I didn't know I was running against the mayor too," says Stratton. "This is unprecedented." Most city council votes are unanimous, concerned with dry functions of municipal government. But on more controversial issues, the council tends to break down on a 5-2 voting pattern. Verduin says Stratton has voted with the liberal-leaning majority 91 times out of 95 on what he calls "partisan votes." Stratton calls those numbers "a disservice to citizens," saying they leave out how those votes were for jobs and human services. She says she's never been told how to vote. Stratton has abstained from voting on anything marijuana-related because she co-owns a recreational pot farm. She voted against an agreement between the city and ride-sharing services Uber and Lyft, and voted against borrowing money from an investment fund to pay for a new city facility. She also opposed removing Councilman Mike Fagan from the health board after his controversial comments regarding vaccines. As for her lack of independence, Stratton points to a vote she hasn't taken on an ordinance, key to Stuckart and his allies, that's been put on hold. For most of the year, Stuckart has been crafting a sick-leave ordinance that would require employers to offer paid time off to workers to deal with illness. In August, he announced that the work would be suspended so council could focus on the budget. Behind the scenes, Stratton says she told Stuckart that although she supports the concept behind the ordinance, it needed more work and outreach before she would vote for it. She's concerned how it might affect "mom-and-pop" businesses, and thought more work was needed to determine what kind of exemptions it should include. She also worries that a separate Worker Bill of Rights initiative could pass, placing too many new requirements on businesses at once. "I have gone out of my way to open up discussion with my community on sick leave and table it until we've had more discussion," says Stratton. Stuckart says he's been "very frustrated" with Stratton. Stratton says that Stuckart told her she would lose electoral support and funding for her position on the ordinance (Stuckart says he doesn't recall the conversation), but their relationship has improved and he supports her campaign. Indeed, as the council's newest member, Stratton has been active on hiring and management practices in the city administration. She successfully sponsored an ordinance requiring the mayor to provide justification for appointments outside the civil service system and another establishing reimbursement rates for city employee meal expenses. She supports services for low-income families and seniors and notes that she voted for an ordinance that provides a framework for business incentives. Verduin and Condon met through a mutual friend. At the time, Verduin was becoming more interested in city politics after starting a business, and Condon appointed him to the Plan Commission last year. He has the endorsements of Condon and developer Jerry Dicker, as well as former councilmembers Steve Salvatori and Nancy McLaughlin. Despite being a political unknown, Verduin quickly outpaced Stratton in fundraising shortly after filing to run. As of press time, he had raised $42,000 to Stratton's $39,000. Condon, who has outraised westside politicians, has appeared at fundraisers for Verduin and the two share donors, although Verduin says he isn't close with the mayor. "I think the citizens expect us to philosophically disagree and having those debates is fine," says Condon, who downplays any conflict with Stratton. Condon says he supports Verduin because his perspective as a small business owner raising a young family is needed on the council. Despite the blessing from the city's more right-leaning politicians, Verduin says he's a centrist, highlighting how he's received neither endorsements nor money from political parties. He'll be independent, he says, like Salvatori or Councilman Mike Allen. "They are very open-minded about the policies they address and are willing to explore options, and you don't know how they are going to vote on every single item," says Verduin. Verduin opposes the sick-leave ordinance, saying it should be a state or federal issue. He supports the sit-lie ordinance. He would have voted against an ordinance requiring apprenticeship work on city public work projects. He says that local police generally shouldn't be concerned with immigration matters. He still says that the council didn't need to pass a controversial ordinance codifying a police policy preventing officers from inquiring into people's immigration status. He would have supported an ordinance making it illegal to block driveways, although anti-abortion activists felt targeted by it. He supports an ordinance requiring two firefighters on non-emergency calls, but would have liked to have seen more flexibility. If elected, Verduin says he would spend about 20 hours on his business and 30 hours on the city council activity each week, and he might not hire a legislative aide, which would make him the least involved member of the council. Other members of the council have stepped back from their businesses after being elected. Salvatori resigned to focus on his business. Verduin is confident he can do both, especially if the council focuses on the right things.